Liz Swafford shares the details of the City of Dalton’s Curbside Recycling Program for an educational video. When schools participate in Target Recycling at School they qualify for free environmental education for all ages through the Dalton-Whitfield Solid Waste Authority. Local groups like the Boy Scouts, Girl Scouts, 4-H, and Homeschool Groups are also able to enjoy the free service. Workshops are also available for adults when they're hosted by a civic group, garden club, or other business organization. Topics range from recycling, waste management, water pollution and conservation, animal habitats, and even trees. Tours, workshops, and class visits are facilitated by DWSWA staff members. (Schedule tours, school visits, and adult workshops online with the Education Program Request Form.) Participants typically also receive a pen, pencil, coloring book or other recycled promotional item to remember the visit. The main contact person for the program is the Recycling and Education Program Coordinator, Amy Hartline. She is a licensed Georgia educator with an ESOL accreditation. She holds a Bachelor of Science degree in Early Childhood Education. She has spent over 1,000 hours as a student teacher in Dalton City Schools, Whitfield County Schools, and Murray County Schools. She is also a member of the Georgia Recycling Coalition. Programs provided include lessons from award winning environmental education curriculum including Project WET (Water Education for Teachers), Project WILD (Wildlife Learning In Design), and Project Learning Tree (PLT). 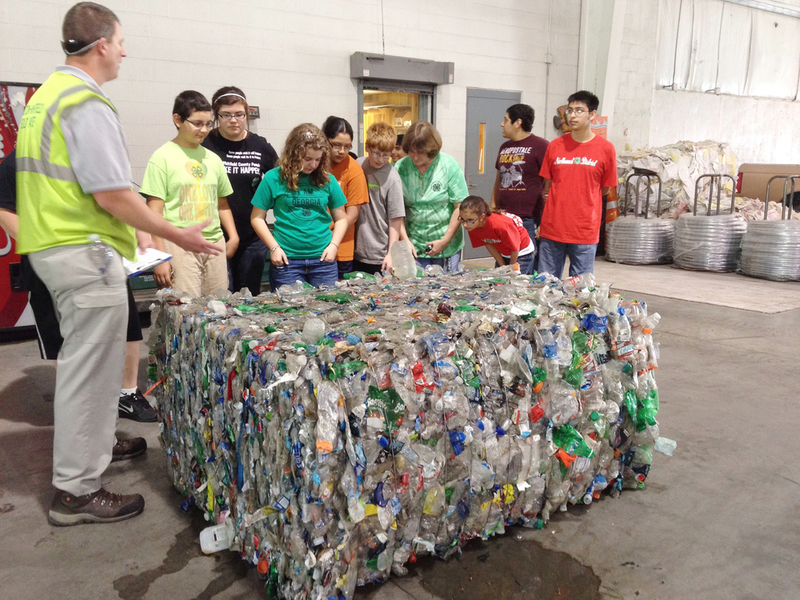 Students guess how many plastic bottles are in a bale during a tour. 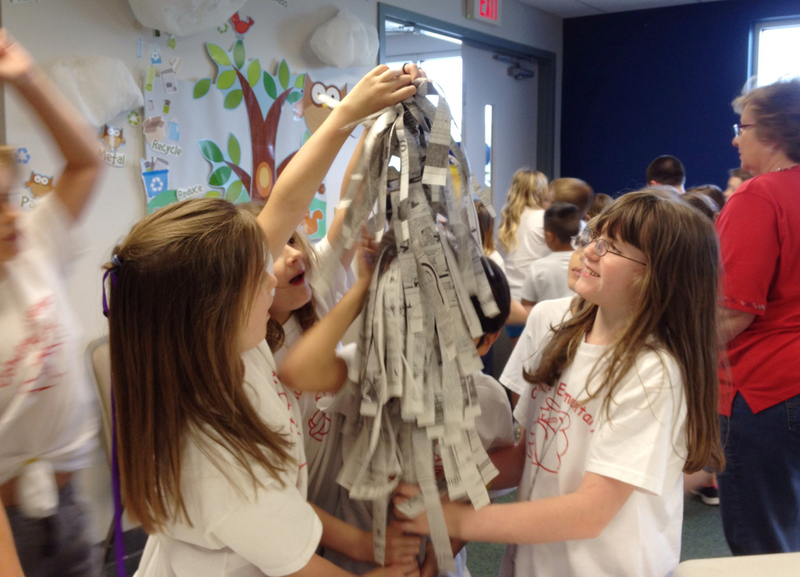 Students on a tour make a tree grow out of newspaper during an activity in the education room. Follow the garbage truck to the landfill and find out what happens to all the stuff that gets thrown away in Whitfield County. Then, follow the recycling truck to the recycling center to learn why recycling makes a difference for our community and state. The tour is appropriate for 1st grade and up, and can be adapted for children and adults. Schedule your tour online with our Education Program Request Form. Tour at the DWSWA facility highlighting the landfill and recycling center. An introduction to waste management in our community. Limit of 60 visitors, 2 groups of 30, to finish in 1 hour. Can do 2 tours on the same day to accommodate up to 120 visitors. Limit of 90 visitors, 3 groups of 30, to finish in 1.5 hours. Can do 2 tours on the same day to accommodate up to 180 visitors. Students will train to become Recycling Ben’s Sidekicks while making Garbage Pizza, a model of a Landfill, taking a tour of the landfill and recycling center, participating in a relay race, meeting mascot Recycling Ben, and completing a Reuse It Challenge. Limit of 30 visitors (1 group or classroom at a time). Limited to 1 group per day. Suggested hours are 9:00 am to 1:00 pm. Includes time to eat lunch. Visitors should bring their own lunch from school / home. Learning Standards and Agenda available upon request. During the 2012 – 2013 school year we introduced Recycling Ben’s Sidekick Training. This program takes place at the Recycling Center’s education and training room. It's designed for third graders, and cannot be done off-site. Sometimes it’s more convenient for our team to go to your school and present to an assembly or a particular classroom. Here’s a selection of activities we can take to you. Most are adaptable to all grade levels and group sizes. Correlations to learning standards are available upon request. Schedule a visit to your school using our Education Program Request Form. • We Are Extremely Very Good Recyclers: Follow Charlie and Lola as they learn about recycling by participating in a competition. Watch the DVD of the episode or read the book. Find out what you can recycle at school and how paper products are recycled. A variety of educational activities are available to enhance what you're doing in school from these award winning environmental education curriculums. .
• Hey, That's Not Trash: Perfect introductory class about recycling for Pre-K and Kinder. Students enjoy a reading of the children's book, "Hey, That's Not Trash", play a sorting game to identify items that can go in a recycling bin, and make a recycled music shaker from their own water bottle. • We All Need Trees: Can you name 10 things that are made from trees? Was one of them paper? Learn how paper is made from trees, and how recycling paper conserves natural resources. Find out what you can recycle at school and what your paper is recycled into. • Guests for Career Day: DWSWA staff is available to visit your school for Career Day activities. We’re prepared to talk about working at a recycling center or in the waste management industry in general. • Garbage Pizza: Make a huge garbage pizza to display in your classroom to show the composition of our waste stream. Learn about reducing, recycling, and reusing your waste. Find ways to improve recycling at your school. • How Many Bears Can Live in this Forest? : Learn about the components of a habitat, carrying capacity, human impact on the environment, and a healthy bear diet as we become black bears. For younger students we’ll also read the book ‘Bear Snores On’. • Every Drop Counts: How much water on the planet is potable? And what types of pollutants affect the water supply? Learn about water conservation through a demonstration on Enviroscape’s model of the Watershed. Students explore sources of water pollution using an Enviroscape watershed model during a class visit. Students from Dalton State College take a tour of the landfill and recycling center managed by the Dalton-Whitfield Solid Waste Authority. Can’t find an activity that fits what you’re studying? More lesson are available from Project WET, Project WILD, Growing up WILD, Project Learning Tree, and Waste in Place. Call us at 706-278-5001 to discuss or e-mail Amy Hartline: ahartline@dwswa.org. Schedule your workshop or tour online using the Education Program Request Form. Call 706-278-5001 or email: lswafford@dwswa.org if you have any questions.